A compelling virtual world that stands the test of time with an incredible 15-year history. We originally reviewed EVE Online in 2003. It has grown and changed so much since then, we decided to review it again. Read more about why we've decided to re-review certain games here. Reviewer Brendan Drain is a long-time EVE player, and also heads indie studio Brain And Nerd, which is currently developing a sci-fi strategy game. What Is It? : Single-shard sci-fi sandbox MMO. “It’s not for everyone,” I say as I introduce a friend to EVE Online, hedging my bets on the off-chance that he actually tries the space sandbox MMO. I know that the reality of the day-to-day goings-on in EVE are unlikely to live up to the amazing stories I’ve told him of political intrigue, colossal wars, and record-breaking betrayals. EVE Online is a deeply compelling virtual galaxy in which incredible stories can take place, but only as infrequent punctuation to a more sedate space simulation. Those epic tales you read are EVE's highlight reel, and each memorable moment you might be a part of will be separated by long periods of patient preparation. When it was first released back in 2003, EVE was a largely empty universe with a smattering of players all trying to grab power and smash each other’s heads in with it. PC Gamer’s original review at the time aptly described it as “a desolate wilderness of constellations,” but for some the challenge of taming that wilderness and carving out a chunk of it for themselves was irresistible. The empty world of New Eden was a newly opened book, and those early players were writing the first chapter in each other’s blood. I was first introduced to EVE in early 2004 and have watched it grow over the years into a complex sandbox with a wide variety of roles and activities to suit different people. Players who enjoy PvP can become pirates or fight for one of the empire faction's militias, spending their days playing games of cat and mouse with other players through the low-security areas of the galaxy. They could join one of the warring alliances out in the lawless null-security regions and become part of massive fleet battles, or join a ruthless war corporation looking for weak groups to gank in high-security space. Combat in EVE is so high-stakes that new players frequently experience physical shaking. PvE-focused players can grind missions to help the NPC-run corporations of EVE fight off pirates and rival organisations and collect bounties in the process, or farm endless streams of NPCs in asteroid belts or cosmic anomalies. Explorers can use scan probes to search space for hidden pirate sites in the hopes of making a big find, or even venture through unstable wormholes into one of the thousands of hidden star systems. Industrialists spend their days hoovering up asteroids all throughout New Eden, manufacturing most of the ships and modules players use, and making profit trading on the fully player-run market. The one thing all of these activities have in common is that they're slow and deliberate, with a lot of downtime between moments of action or surprise. Players will spend hours hunting for that elusive kill for an adrenaline high (combat in EVE is so high-stakes that new players frequently experience physical shaking). Or they'll spend that time farming ISK (the in-game currency) to replace lost ships, analysing markets for opportunities, and designing the perfect ship setups for particular tasks. You could look at this as busywork or grindy gameplay, but it's all in preparation for those moments of action that matter most. Every player you talk to will have small emergent stories of battles they were part of or other interesting things they've done in the sandbox, but underneath each story is painstaking prep. Grinding up ISK to buy PvP ships is what ultimately enables that chance moment where you bag an amazing kill, or lets you join a fleet battle that makes history. Investing the time to forge social relationships and figure out how the game works is what turns you into the expert people rely on, even into a leader of thousands. Are the infrequent highs of EVE worth the slow plod of progression and preparation in between? I definitely think so, and I'll gladly take hours of mining and fiddling with ship setups if it means that one day I'll have a story to tell. EVE may be 15 years old at this point, but the new player experience is practically brand new and starting a character is now quite a polished process. You’ll get plenty of information on each of the four playable races before making your choice, and design the character with EVE’s in-depth body and head sculpting character creator—but keep in mind that this is all largely cosmetic. Any race can train the skills to fly any ship, and your character will only be visible as a small head-shot photo in-game since CCP disappointingly abandoned its ‘walking in stations’ feature. The tutorial itself gives simple step-by-step instructions and is fully voice acted to keep players engaged throughout, which is a damn sight better than the start I had in 2004. You'll also get to take part in a simulated fleet fight with NPCs, which is a nice touch as it gives a good sense of the scale that EVE reaches if you eventually join a player alliance. The one thing the tutorial can't guarantee is that you'll have intrinsic motivation to keep playing when the scripted story ends and the reality of EVE’s slow progression sinks in. Many new players report having an "OK, now what?" moment when they aren't being told what to do anymore, and some just decide to stop playing. Why is that? Above: An example of what a major battle looks like in EVE. The truth is that EVE Online is a fundamentally slow game that requires a considerable time investment to make progress in, and that can make it very boring for new players. Simple tasks such as travelling to a space station and picking up an item require just clicking a few buttons, but can take several minutes to complete, as you watch your ship slowly warp to the station and dock. Long journeys from one corner of the galaxy to another can take so long that doing them manually would melt your brain, though there's an autopilot feature which will do it all for you (albeit at a reduced speed). Mining is similarly boring in that you only need to interact with the game once every 15 minutes or so to empty your cargo hold, and it takes several hours of mining for a new player to get enough ore to build a new ship. While these everyday tasks take a lot of time and are thoroughly unengaging, they play an important role in allowing people to play at a relaxed pace or even run EVE in the background and still make progress. I'm not ashamed to admit that I often spend evenings quietly mining or hauling on one screen while playing Overwatch or watching Netflix on the other, and there's something compelling about knowing that I'm still being productive in my downtime. Making these activities more actively engaging might improve the minute-to-minute experience of new players, but EVE would lose something fundamental—the contrast that makes the exciting bits so exciting and the pain of loss so devastating, the slow progress that makes joining a corporation so important and encourages socialization and specialization. When you do have the time to actively engage with EVE, a faster pace of action can be found in other activities such as combat missions and exploration sites. On the extreme end of the activity scale are PvP and the new Abyssal Deadspace PvE dungeons, both of which require your complete attention as you have to rapidly respond to changing and emergent circumstances. The UI is now a hodge-podge of windows and other elements designed at different stages of EVE’s lifetime and following different visual styles. The user interface is another major sticking point for many new players. My housemate once described it as an “unfriendly, scary, complicated calculator,” and he’s really not wrong. EVE’s age is partly to blame for that, as there are now over 15 years of features built on top of each other and it all has to be crammed in somewhere. The UI is now a hodgepodge of windows and other elements designed at different stages of EVE’s lifetime and following different visual styles. Unifying features such as tooltips, the taskbar, and notifications help add some much-needed cohesion and explorability to the interface, but the rookie help chat channel is still always packed with players asking for help finding the options they want. New players also often find the realtime skill progression system unfamiliar and limiting, and some of the higher level skills require several months of just waiting to acquire. Skills essentially act as roadblocks between you and the ships and modules you want to use, and there’s no way to actively train them up through normal gameplay as you would in a typical MMO. Rich players can also buy skill injectors from other players to add skill points directly to their characters and skip those realtime roadblocks, a feature that is regarded by some to be a form of pay-to-win gameplay. Misc. gfx options: Post Processing, Shader Quality, Texture Quality, LOD Quality, Shadow Quality, individual visual effects can be toggled. Though EVE as a game is now 15 years old, the engine has been remastered over time and the graphics have been kept up to date with current standards. I get a solid 60 fps in complex scenes with dozens of ships and objects on an Intel Core i7 3.4GHz system with a Radeon HD 7870 and 16GB RAM with all the graphics settings on maximum except for anti-aliasing, which is set to medium. I'll occasionally drop to 30 fps in the rare scene with a lot of gas and particle effects. The main performance constraints are server-side, with star systems beginning to lag when hundreds of players gather in the same place unexpectedly. The server will slow to as low as 10% normal speed to counteract the effects of lag, but serious lag and disconnections will still occur in the largest battles involving thousands of players. The real appeal of EVE Online isn’t in the minute-to-minute play but the things that groups of players can accomplish over time if they work together. Most people who play EVE in the long term aren’t masochists who love the clunky controls and the user interface that looks like it’s straight out of Microsoft Office. They continue play because they’ve become part of a community and feel like they belong to something. MMOs are at their best when played with a tight-knit group of good friends, and EVE does a great job of empowering groups and rewarding cooperation. A new player will start the game able to fly only his chosen faction's tech 1 frigates, small and fast ships with limited firepower and defences. Alone, they can realistically only accomplish basic PvE and mining tasks. But they can quickly upgrade to larger ships such as high-damage destroyers designed to kill frigates or tanky cruisers that can take a lot more of a beating, and this isn't just a linear upgrade path. Every ship has a purpose in the context of a group, and the lowly tech 1 frigate can play the vital role of PvP tackler after just a few days of skill training and mentoring. As part of a small gang, the tackler's role is to get close to enemy ships and hold them in place while the big guns do the killing, using a Warp Disruptor or Warp Scrambler to keep the enemy from warping away and Stasis Webs to physically slow their ship down. Further training allows players to specialise into other PvP fleet roles, flying heavy damage-dealing cruisers, logistics ships that repair friendly ships on the battlefield, or electronic warfare ships that can target-jam enemy ships. EVE Online is to this day the most fascinating virtual worlds to observe and to read about. 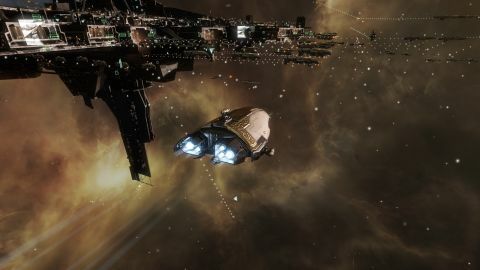 EVE Online’s single most defining feature is its shared single-shard and instanceless universe, which allows groups of practically any size to form. This encourages players to band together for mutual benefit, forming corporations and alliances with shared identities, motivations, and long-term goals. Large training organisations such as Signal Cartel, EVE University, Pandemic Horde, and Karmafleet regularly recruit new players and offer everything from free ships and advice to structured activities. Even a small independent corporation can build and maintain its own space stations, see success with roaming PvP gangs, and tackle high-end PvE content such as dangerous wormhole anomalies and combat sites. The bad news here is that EVE Online doesn’t offer much of a compelling hook for the solo player who isn’t interested in joining a corporation and isn’t out to make friends. Lone wolves will typically only be able to engage in repetitive solo PvE play such as combat missions, mining, and trading, can struggle to stay alive outside of high-security space, and will be extremely hard pressed to find PvP fights they can win. EVE Online is a ruthlessly social game that can be difficult to succeed in on your own, which is both its greatest strength and one of its most cited failings. EVE Online is to this day one of the most fascinating virtual worlds to observe and to read about. On the largest scales, huge alliances gather thousands of players together into massive fleets and carve up lucrative areas of the galaxy between them, giving rise to politics and warfare that often mirrors the real world in startling detail. There are areas of space controlled by coalitions of American and European alliances, regions annexed by the Russian power blocs, and countless neutral states and vassals paying tithe to far-off lords. Most new players will give EVE a try after reading some incredible story of a record-breaking war or political betrayal in the sandbox, only to be confronted by a terminally slow game with so much depth you could drown in it. Many do. A combination of more than 15 years of new features and niche gameplay that remains distinct in the MMO genre conspire to make EVE a difficult game for the average person to get into and enjoy. EVE's big saving grace is its unparalleled scale and welcoming community, from the training corps that will show new players the ropes to the alliances that will eventually bring them into those history-making battles we’ve all read about. If you’re in the market for a sci-fi MMO that’s more of a long-term hobby than a passing interest, something that you can become deeply engaged with and find a place to belong in, I highly recommend EVE Online. If you manage to scale the learning cliff and aren’t put off by the indirect controls and disharmonious user interface, you’ll be joining one of the most compelling virtual societies in gaming history and a world in which your actions can have real consequences. Just don’t try to go it alone.